Photo posted with permission from Dr. Hitzig. We will also be talking to Dr. Hitzig about his Acell MatriStem experiment, feel free to raise any questions here. We are growing new hair in prior donor scar sites as well as duplicating (growing multiple hairs from a single transplanted beard or donor hair) in the bald recipient area" states Dr. Ted Chaglassian, a Board Certified Plastic Surgeon and former Chief of Plastic Surgery at Memorial Sloan-Kettering Hospital and Attending Physician at Columbia Presbyterian Medical Center in NYC." i wonder if acell really has anything to do with scar improvement or is the new way for doctors to sell us illusions for big money. » new way for doctors to sell us illusions for big money. And I wonder why you wonder. Who is Acell and what exactly are they doing? - nothing more. That means, there is really nothing to speculate. » » new way for doctors to sell us illusions for big money. » And I wonder why you wonder. » Who is Acell and what exactly are they doing? - nothing more. » That means, there is really nothing to speculate. Yup - its scar repair. They threw in “hair cloning” to drum up business. “We are growing new hair in prior donor scar sites as well as duplicating (growing multiple hairs from a single transplanted beard or donor hair) in the bald recipient area” states Dr. Ted Chaglassian, a Board Certified Plastic Surgeon and former Chief of Plastic Surgery at Memorial Sloan-Kettering Hospital and Attending Physician at Columbia Presbyterian Medical Center in NYC." I don’t think that particular statement leaves them any more room for weaseling around. Either they’ve made some legit progress or they just told us a flat-out lie. One or the other. Ask him why he released a press release claiming a hair cloning “breakthrough”, then backed away from those claims the very next day. » “breakthrough”, then backed away from those claims the very next day. can you tell us where did they back away? » » “breakthrough”, then backed away from those claims the very next day. » can you tell us where did they back away? Listen to the bald truth interview. Despite a press release stating that they had made a “hair cloning breakthrough”, he is totally ambiguous, avoiding Kobren’s direct questions. He plays up the scar repair ability, downplays the hair multiplication aspect (despite hyping it in the release). I don’t know who Dr. Ted Chaglassian is, I’ve never heard of him, but someone who is/was associated with Sloane Kettering Memorial Cancer Center in NYC (I have a cousin who works there and her mom was cared for there by great doctors…) AND Columbia Presbyterian Medical Center – well, these are the BEST names in American medicine so this guy has a lot of credibility. I’m not knocking any of that and am definitely willing to give these doctors the benefit of the doubt! Now, on to my skepticism. I don’t know how they can call this “hair cloning” when they admit it is not yet “reproducible”. They say in their own annoucement, that they want to make the procedure “reproducible”. NOT “more reproducible”, but just “reproducible”. Well, if it’s not reproducible as it is RIGHT NOW, how can they say it’s legitimate “hair cloning”??? A fluke maybe, but to say this is “hair cloning” seems stretching things A LOT. Will they disclose that the procedure is not reproducible to their patients? Will they disclose this in informed consent forms??? Look at the pictures! Only one set of Before/After photos was presented. Why only one? Because the procedure is still not reproducible (See my #1 above…) Also, in the Before shot, you see a lateral, curved scar (normal for a strip transplant skin excision), with bands of hairless skin on either side, above and below the scar. The band of hairless skin above the scar is the most pronounced and biggest, and seems to be completely denuded of hair. ARE THEY SAYING THIS IS NORMAL FOR HAIR AROUND A STRIP SCAR? How is it normal? Was that “shock fallout”, or is it bald only because it was shaved??? PLEASE DISCLOSE THIS!!! Also, wouldn’t you EXPECT that hair to grow back in fully? Isn’t that what most/all HT strip doctors tell their patients – that they expect that hair to grow back? Even when a patient with a brain tumor has brain surgery, scars are made cranium and scalp, and THEN THE HAIR GROWS BACK except for maybe a little bit over the scar. BUT YOU DON’T SEE LARGE BALD AREAS PERSISTING ON EITHER SIDE OF THE SCAR IN POST-OP BRAIN SURGERY PATIENTS, 4 MONTHS AFTER SURGERY!!! Then why should you expect to see this kind of baldness on either side of a strip scar in a normal HT patient??? PLEASE ANSWER THIS QUESTION!!! What exactly are they claiming??? That hair grew de novo, where there was only thin hair or complete baldness before??? THEN PLEASE PROVE IT!!! Please show evidence with clearly marked-off portios of scalp, with before and after HAIR COUNTS!!! I don’t see an of this kind of evidence in what they have presented here! 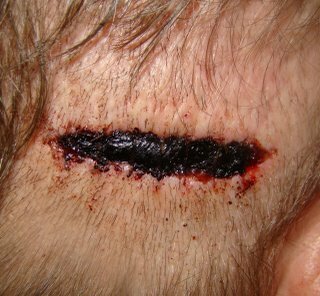 Normally, with a strip scar, PATIENTS ARE TOLD TO EXPECT THE HAIR ON EITHER SIDE OF THE SCAR TO GROW BACK IN. 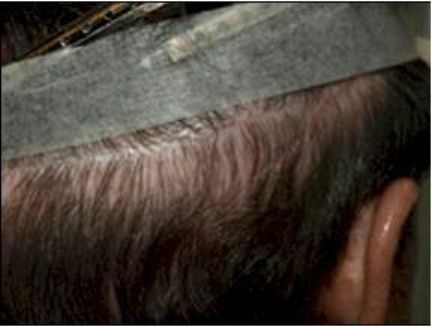 If the hair in the general donor area (in back of the head) appears thinner and the scar is visible after the strip excision, it is NOT supposed to be because of secondary baldness, it is supposed to be because the HEAR-BEARING SKIN WAS STRETCHED over a greater distance, thus causing the hair to look thinner. So, the burden is on these docs to PROVE this is a real hair cloning, or hair mulitplication procedure. IF THEY CLAIM THIS, but cannot prove it with real medical evidence, then people will complain to the FEDERAL TRADE COMMISSION and they may be sanctioned, fined or prosecuted for false advertising!!! PEOPLE – DEFEND THE RIGHTS AND THE INTEGRITY OF THE HAIRLOSS COMMUNITY!!! » give these doctors the benefit of the doubt! » Now, on to my skepticism. » they disclose this in informed consent forms??? » was only thin hair or complete baldness before??? THEN PLEASE PROVE IT!!! » they have presented here! » greater distance, thus causing the hair to look thinner. » PEOPLE – DEFEND THE RIGHTS AND THE INTEGRITY OF THE HAIRLOSS COMMUNITY!!! I want to see more before and after pictures. » I want to see more before and after pictures. At least, here you can see how “hair cloning” should work. If it not works (new hair growth within the wound), some Docs didn’t learn their lessons or didn’t follow Acell’s MatriStem protocol. At least, I have no other explanation. » Medical Center in NYC." » » Medical Center in NYC." I just can’t believe these guys still pull this sht. “Here’s a photo! Here’s another photo! Can’t you tell the difference?” No hair counts, no data, nothing. Don’t you see it shows that scar is covered with hair. Why can’t you guys be positive? Wait and see. These guys didn’t ask for money yet. Acell is company that has success with other products. I don’t see anything wrong with these pictures. » I just can’t believe these guys still pull this sht. “Here’s a photo! » » » questions here. » » » Medical Center in NYC." » » » » questions here. » » » » Medical Center in NYC." » » I just can’t believe these guys still pull this sht. “Here’s a photo! From what I see the hair above the scar is lifted in linear direction - in a straight line. If what I see below of that straight line is healthy, hair bearing skin,and if the difference in the appearance of density below that straight line is a result of the hair lifted above (and not something else),then why the area where I see that difference in density is oval shaped? Is it not logical that if such difference would occur below the showed ,dividing,straight line,must also start,and end,in linear direction,or straight direction ? Please forgive me if the answer is obvious,but I am not very bright.can someone tell me? I would like to add that I follow this kind of solution for scars reduction with great interest because I have a wide scar from HT and,this time I should do my due diligence of research,because,it was my fault I didn’t do research before and it was utterly impossible to convince anyone I tried to that I was not an idiot for not doing research. The problem seems to be that they are making claims without utilizing the scientific method, which calls for marking off the exact same areas for the before and after shots, shaving the hairs down to about 1 centimeter or 0.5 centimeter, and then paintsakingly doing hair counts. If they have done this alrady, great… why haven’t they released their results??? If they haven’t, then they’re relying on sight alone, which is very subjective, even for HT doctors. Please, doctors, either do hair counts, or be careful about claiming you’ve grown new hair, until actual hair counts are done and new growth is confirmed! Also, the hair below the scar in the After shot looks thin, if you take a good close look at it. I mean it looks REALLY thin – exactly as you’d expect to see after a strip excision, maybe even worse. It looks like the hairs are combed straight downward, but you can see a lot of bare scalp underneath and in-between these combed hairs. (2) Compare the density of the hair in back of the head (in the general vicitity of the scar, above and below) 4 months or so after the strip excision, to the previous density before the strip excision was done… If the hair is a lot less dense after, and looks thin, just like it looks normally after a strip excision, then what is the benefit obtained from this? On the other hand, if the density in the donor area turns out to be the same as (or better than) it was before the strip was taken, then this stuff works. But I don’t really see that from these pics. These photos are of very poor quality, they look very misleading. It says - Reply to the message from barnie.If yes,can you answer?If not,my question would just be covered,because I think people tend to start reading from the last post and someone who would be able and willing to answer my question would not see it.